Beloved, myself, and a couple of friends ate at Botejyu a few weeks ago. This Japanese place is one of the few places open at Vertis Ginza, the Japanese “section” of Vertis North. The restaurant features Osaka specialties, which I honestly don’t know much about. The place seemed intimidating which is why we haven’t tried this place before, but after a recommendation from another common friend, we decided to try it out. Their menu was indeed quite intimidating featuring beautiful and mouth-watering photos of their food. This is especially true with their okonomiyaki and okosoba with self-proclaimed “Legendary” taste. Also, upon reading the menu, I learn that Osaka specialties include the two dishes already mentioned as well as takoyaki and beef bowls, which are essentially familiar things that we’ve already tried elsewhere. 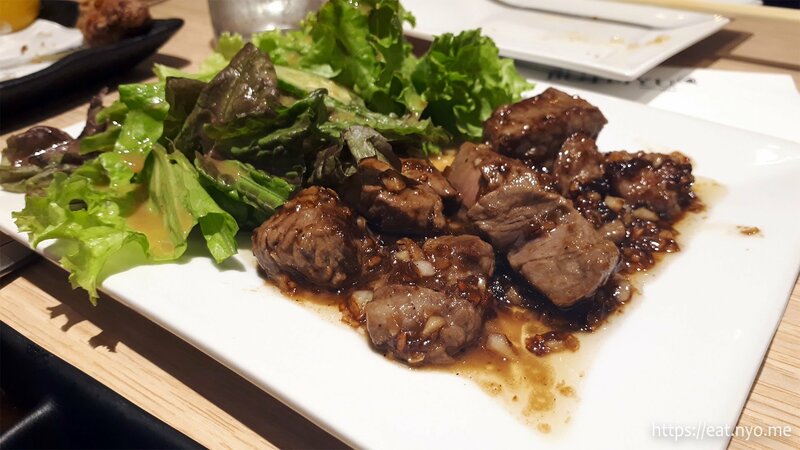 They also serve non-Osaka specialties that are also familiar, basically almost anything you can think of that can come from a Japanese resto. Anyway, after much deliberation, the four of us decided to share one of their “Legendary” Okonomiyaki—their Premium Okosoba (435 Php), which is an okonomiyaki or Japanese Pancake with soba noodles containing beef, pork, shrimp, and squid. I also ordered their Bite-size Beef Steak (365 Php) because it looked amazing in the picture. Beloved ordered their Exquisite Oyakodon (295 Php). Finally, because I was sure I won’t get full with my order, I also ordered their Kushi Katsu (125 Php). 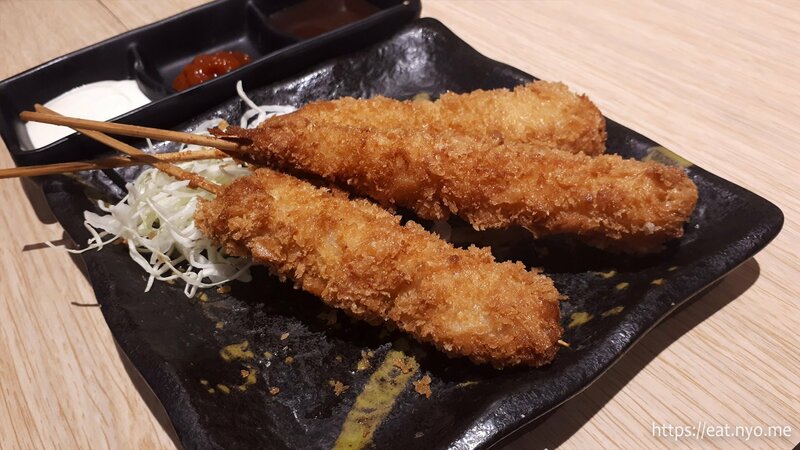 Their Kushi Katsu were three different deep-fried katsu on bamboo skewers, specifically shrimp, pork, and chicken. They’re not too different from any katsu I’ve tried before. It definitely needed some sort of sauce which the table has a lot of, otherwise, it’s mostly just texture. My main complaint was that they were all sticking to the skewer. Beloved quite enjoyed her order, their Exquisite Oyakodon. While it’s still your (un)usual egg-and-chicken combo, their eggs were on the wet and sloppy side, which Beloved enjoys a lot. The chicken was soft and tender, but really, the “child” part of the bowl here was the outstanding piece. The veggies on the side were a nice touch, but were mostly given to me. The amount of rice made Beloved quite full. My Bite-size Beef Steak was a bit disappointing in quantity. Even when sliced into bite-sized cubes, the amount was quite meager, perhaps half of what I was expecting. Taste-wise, it’s much more disappointing. Perhaps spoiled by the melt-in-your-mouth wagyu beef we’ve partook in other places, this one was a bit on the chewy side. Flavor-wise, it’s basically salpicao—very garlicky. While I like garlic, it’s not what I expected and wanted that moment. Finally, their “Legenadary” Premium Okosoba arrived last, and we had it cut into quarters. I was a bit disappointed in the amount, because it felt like something I can consume on my own. It was not too different from a okonomiyaki place I’ve tried before but haven’t reviewed yet in this blog. The lack of the mainstay bonito flakes was explained in the fact that this is part of the condiments available in the table. You really need to add the different sauces, otherwise, it’s a bit too plain. What I dislike most is that the four meats were not evenly distributed, and some of us only got to eat two or three variants. I think if you have this solo, you’ll enjoy more (if you don’t think about the price tag). Our bill amounted to almost 2,500 Php (including what our friends ordered), where more than half of these were of Beloved and my own order. Value-wise, it fails. 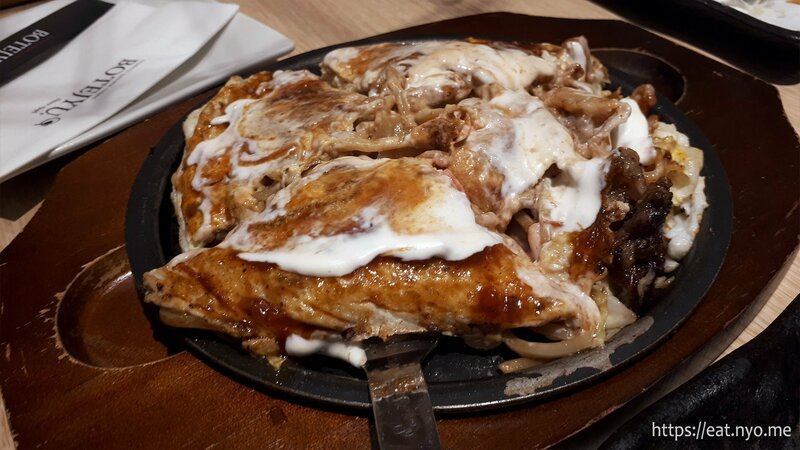 It’s just a little bit too expensive for me; I can find an alternative of what we ordered for cheaper from other Japanese places, and those places are often specialty places that offer superior versions of what we ordered, particularly, the okonomiyaki. Or maybe I was just hugely disappointed that the scrumptious looking beef cuts tasted more like locally prepared beef salpicao rather than melt-in-your-mouth marbled beef. Also, I seem to have a complaint or two on all my orders. And, finally (for me), I didn’t get full with my order, as expected, despite having three different dishes. 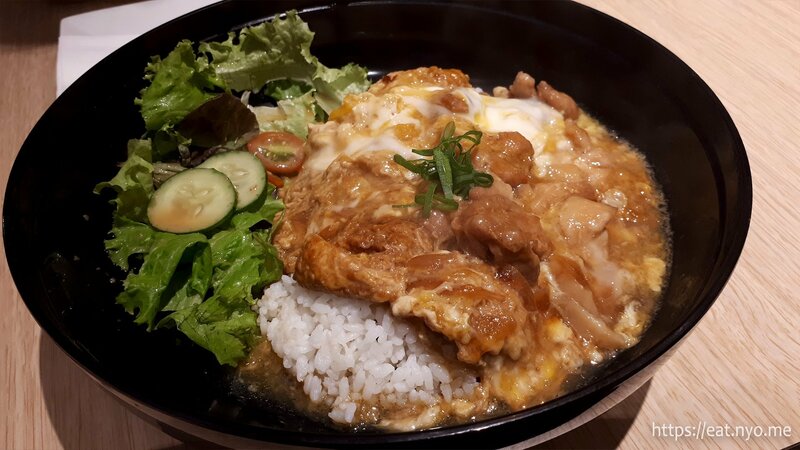 Beloved did not have any complaints on hers and was happy enough with her chicken-egg bowl. Also, our friends, who also ordered rice bowls, also seemed to enjoy their orders, although not strongly. Thus, overthrown three-to-one, I’ll be giving Botejyu a pass, although the “worth it”-ness will hugely vary—maybe stick to their much more filling and slightly more affordable rice bowls. Recommended for: Rich Japanese food lovers. Not recommended for: Poor Japanese food haters; starving rice/carb avoiders. Smart nomnomnom tip: Their rice bowls will get you full.